“Da-Da-Da, Da-Da-Da”! You might be familiar with this tune that can be heard multiple times when watching ESPN SportCenter. 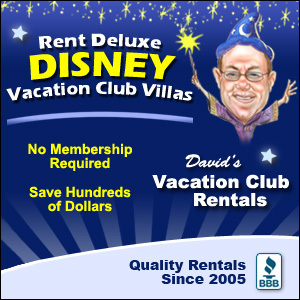 Well, if you are an ESPN fan or just a big sports fan – Disney has the right place for you to dine. 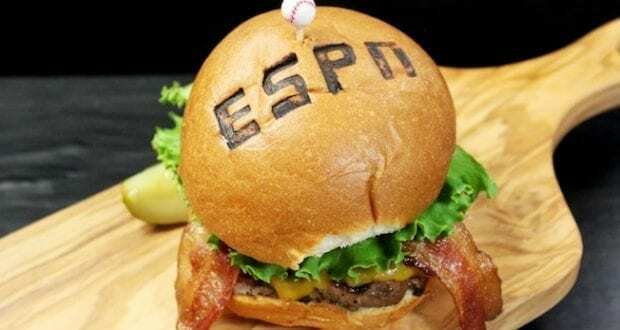 Here are 5 things we think you should know about the ESPN Club restaurant before you make your dining plans at Disney World. Stroll along Disney’s timeless Boardwalk to find the ESPN Club located at the very end of Boardwalk’s horseshoe layout – neighboring Ample Hills Creamery. 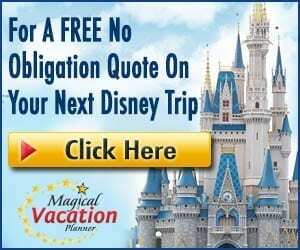 A short walk from Disney’s BoardWalk Inn and Villas, the Swan and Dolphin Hotels, and Disney’s Yacht and Beach Club Resorts – ESPN Club is perfectly located for anyone staying at one of these Epcot Resort Hotels. If you aren’t an Epcot Resort guest, you are still welcome to enjoy ESPN Club and the Boardwalk amenities by walking or boating from Epcot or Hollywood Studios or driving in by car to park at the BoardWalk Inn and Villas. You can’t miss the ESPN Club entrance on the Boardwalk with its bold ESPN Club sign and handbell structure, all the while staying true to the Boardwalk theme. Step inside the ESPN Club and you’ll immediately feel the warmth and excitement of the game underway with the large bar situated with some seating on the right and steps down into a larger seating area on the left. If there was ever a true American pub – this is it! 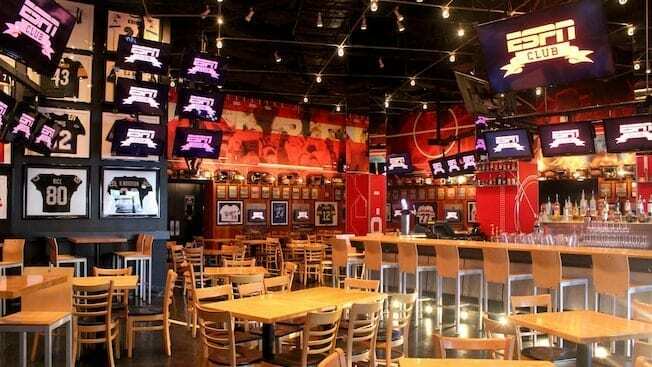 Sports memorabilia litters the walls from top to bottom and nearly 100 video monitors of all different sizes flood the restaurant as multiple games unfold on screen. Even the bathroom stalls have TV screens so you won’t miss the action! We especially love the control room which looks like something straight out of a stadium box office. The glass wall shows the inside filled with controls and is manned by staff to keep the games rolling on the screen. If you catch ESPN Club on the right day, shows such as Mike and Mike in the Morning have been known to broadcast there! We also appreciate that there is no bad seat in this house with a screen around every corner. We really didn’t know what to expect from the ESPN Club food. Every “pub” is slightly different in what they serve and we honestly weren’t expecting much. Disney takes their pub style food up a notch however with the ESPN Club’s vast menu and refreshing taste. All the typical pub favorites are on the menu such as nachos, sliders, wings, burgers and fries – but ESPN Club also boast a great gathering of specialty dishes such as pan-roasted chicken, pulled pork grilled cheese, seafood mac and cheese, surf and turf, and chicken and waffles. All-time American favorites but with an added punch of taste. Overall, we were very pleased with the food and with the desserts of course! Try the pineapple upside down cake or the warm bourbon-pecan brownie. What goes better with American-style pub food and TV screens playing all the current games than a beer in the hand! ESPN Club has all the beer selections you could dream of flowing from the bar. The usual draft beers like Bud Light, Millers Light, Coors Light, Yuengling, Michelob Ultra, Blue Moon Draft, and Sam Adams just touch the surface of selections. They also have a great list of featured craft beers such as the Old Elephant Foot IPA and Cigar City Brewing Lager, just to name a couple. Not a beer fan? No worries – check out the surprisingly impressive list of wines available by the glass or bottle. Keep in mind that dining reservations are not typically available at the ESPN Club. Instead, ESPN Club is a first come, first serve style restaurant. Due to the volume of fans that flock in for specific games and events, this place can be packed which makes seating tricky. Reservations are typically accepted however for weekday lunch reservations between 11:30am-4pm, Mondays through Fridays only. Dinner or weekend lunch reservations are not available due to the uncertainty of game schedules. Our experience with ESPN Club is that if it’s not a busy game day, the restaurant is typically very quiet and seating is easily available. Come game day/time – it fills up with excitement fast! Have you had the chance to check out this sports fan’s paradise? We’d love to hear about your experience!